As a reminder: I am writing these as RETROSPECTIVE reviews, so I will be discussing reveals, resolutions of cliffhangers, ends of plots, etc. If you are reading these reviews without having seen the eps, a) what is wrong with you?? Go watch them now! and b) these reviews are not for you till you’ve seen them. I argued in my last retro review that the cliffhanger between Series 1 and 2 was much more tense and nail-biting than the one between 2 and 3. The palpable standoff between Our Heroes on the one end of a coat-bomb, and Our Villain on the other end of snipers was hair-raising. Even the abbreviated recap of the dialogue that A Scandal in Belgravia starts with doesn’t dissipate the tension one iota. The resolution of that tension (which built for 18 months for those following Sherlock at the time of broadcasting) is so ridiculous, so gasp-guffaw inducing, and so “funnily lame,” as Moffatt put it in the Blu-ray commentary, but somehow also ups Moriarty even more as a villain than ever before. The simplest of interruptions–Moriarty gets a phone call–and it’s masterfully performed. Moriaty’s ringtone (the Bee Gees’ “Stayin’ Alive,” of all things, which has more significance later in The Reichenbach Fall) plays for a full 30 seconds before we realize what it is by his operatic nonchalance: “Do you mind if I get that?” which then morphs into downright unhinged rage: “I will find you, and I will skin you.” Whomever is on the other end of the phone is that much more interesting than blowing himself and his nemesis up? Who could that possibly be? And then we hard-cut to, shall we say, a lovely lace-clad shape with a whip in frame. We then get a lovely case-montage, with a series of puns on original Doyle-canon Holmes titles (some of which are real groaners for us Sherlockian nerds especially), which culminate in an intensely clever introduction of the Sherlockian Hat: Sherlock attempts to hide from a crowd of admirers and paparazzi (“I’m a private detective; the last thing I need is a public image”) behind the famous deerstalker hat, only to accidentally forever stamp it as his signature. 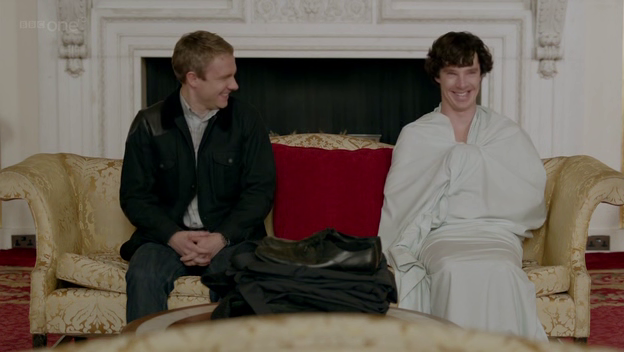 Our introduction to this show’s Irene Adler happens right after what is probably my favorite scene in the entire series to date: the famous Sherlock In A Sheet And John On A Sofa In Buckingham Palace scene. The pacing, chemistry, and comedic timing between Cumberbatch and Freeman is spot-on in this scene, and the addition of the stuffy Equerry and Mycroft is pure gold. It is apparent that Martin Freeman does not need lines to be eloquent and expressive. In the original, Holmes dresses as a clergyman, and after a faked scuffle is admitted into Adler’s home to be tended to. Then Watson starts a false fire alarm (in the original story, it’s a plumber’s smoke rocket) and that forces Adler to give away where she has hidden the incriminating photograph of her and a member of royalty. 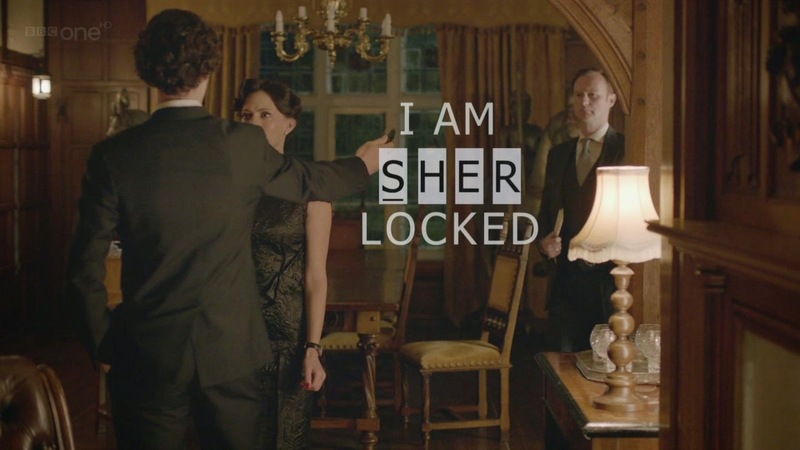 This is where the close similarity between the original and the show’s story arc ends, however, as we then embark on a year-long journey following Sherlock’s quest for the passcode to Adler’s camera phone, and some perceived meanderings into what we are led to believe is him falling for her. The conclusion is an elaborate double-double-cross, as Adler feels she has “played the Holmes boys,” only to find that Sherlock has one-upped her right back. At the end, we have a lovely echo of Holmes’ reference to and memory of Adler and the famous “the woman” debate amongst Sherlockians (how is it really pronounced?) as he keeps her empty phone (the original Holmes keeps a photograph of her) and we get to see a memory of him saving her life. BONUS: Why is it that pretty much every adaptation of Holmes stories portrays Irene Adler as a love interest? That’s not who she is in the (one short) story at all. Is it because Watson insists Holmes does not have “any feeling akin to love for” her, that we feel like we’re being given reverse psychology? Is it because Holmes refuses compensation for the case, but takes her photograph as his only payment? Is it because he refers to her as the woman? Even in this series she just has to be a love interest, doesn’t she, even though she says she’s gay? EASTER EGG: When Adler sends the solution to the email’s secret code to Moriarty, he texts Mycroft: “Jumbo jet. Dear me, Mr. Holmes, dear me.” This is a reference to a telegram which Sherlock receives in Doyle canon novel The Valley of Fear. It was from Moriarty, and read only: “Dear me, Mr. Holmes. Dear me.” Holmes knew, as Mycroft does in this ep, that it spelled doom for his client. My latest retro-review for these folks.